In Flakes is a temporary street installation in Japan for the sakura matsuri (cherry blossom festival). 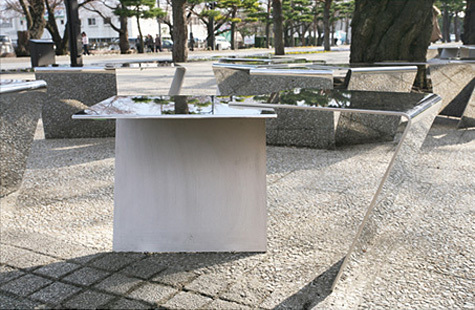 The mirrored benches maximize the beauty of the cherry blossoms by reflecting the branches of blossoms in various directions. The benches themselves disappear at certain angles. Wouldn't this be wonderful during the fall? Designed by Mount Fuji Architects Studio.